Working as a grandfather is not his only means of combatting loneliness. Source: avito.ru. 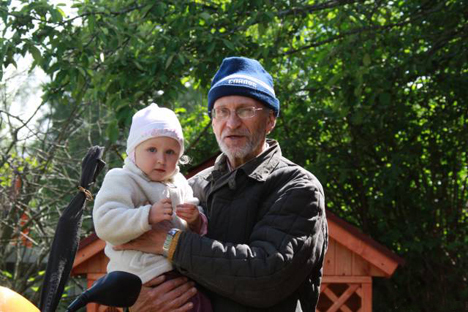 A 67-year-old pensioner from Moscow first took up babysitting to fill the long and lonely days after his wife died. A Moscow pensioner, 67-year-old Vyacheslav, goes to see his granddaughter every Friday – something he looks forward to all week. On the days when he is not visiting his own family, Vyacheslav works as a professional granddad: he takes other people’s children to school and after-school clubs, and he occasionally treats them to some of his homemade soup and apple pie. Vyacheslav says he became a “part-time granddad” to avoid loneliness, following the death of his beloved wife. “I teach drawing, pyrography, woodcarving, chisel-work, chess, checkers and other activities. I take children on outings to the cinema or theatre. I offer home-cooked food; shchi, soup, porridge, scallops and apple pie. 67 years old, university-educated, without any bad habits.” This was the ad Vyacheslav posted on the Internet (he asked for his surname not to be published, as he is not seeking fame). “I often hear people complaining about how hard it is to find a babysitter while they are at work. I came across an advert for a part-time dad and thought: ‘Why not give things a try as a part-time granddad?’” says Vyacheslav. He adds that he has professional experience as a teacher: when his son was in first grade, Vyacheslav led a pyrography club and gave basic lessons in politics at his school. Grandpa Slava says that he has only ever needed to place two ads, as he neither needs nor wants too many customers. He invites all potential clients to meet him at his home, and they mainly question him about his family, grandchildren and any bad habits of his about which they should know. Vyacheslav only accepts charges living in his part of town and who are between the ages of four and 12. “This is my favorite age group, because very small children cry for their mother, and it can be hard to find a rapport with teenagers,” he says. Once a week, he goes to see his own son and granddaughter, who live more than an hour away. The rest of the time, Vyacheslav is alone: “My wife died of a heart attack. I looked after her for three years. I learned how to cook.” Grandpa Slava says he can cook pretty much anything, although, for some reason, his clients are not overly interested in his culinary skills. “It could be that they don’t want me to hang around their house for too long,” Vyacheslav says. Vyacheslav lives near Sokolniki Park, which often holds dance sessions for elderly Muscovites; he never has the desire to go out dancing, though. “I don’t like living on my own, and maybe I am wrong not to want to go to these dances. But I will never find another woman like my wife. And ladies at this age tend to place money or a nice flat above love and companionship,” he says.